The Show the Art Finishers Sub Only 4 event is officially in the books with two new division champions each taking home $2,000 in prize money and a custom embroidered belt. The event was held at Pure MMA in Rockaway, New Jersey, Saturday, August 26. The women’s 150 lb division saw Jess Feliciano and Amanda Leve meet in the finals, with Amanda Leve being the eventual women’s champion via rear naked choke and taking home $2,000 cash after 4 submissions within regulation. The men’s absolute division had Jesseray Childrey and Dan Martinez meet in the finals, with Dan Martinez securing a rear naked choke in overtime and taking home the title of men’s absolute champion and his own $2,000 cash prize. 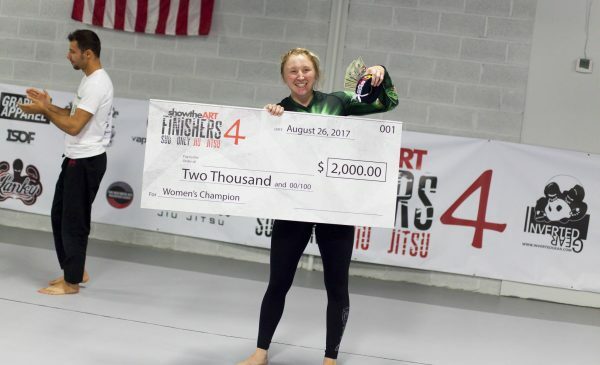 Sponsors awarded other cash prizes such as a $250 cash prize for fastest submission, which went to Sara Monzeglio for an armbar in 53 seconds. 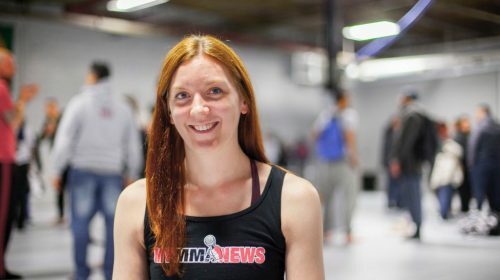 Best break out performance went to Jess Feliciano with a $200 prize for taking the women’s division by storm with just over 2 years of experience, making her way to the finals with a kneebar and an inside heel hook submission in regulation, and fastest escape time in her semi-finals match. 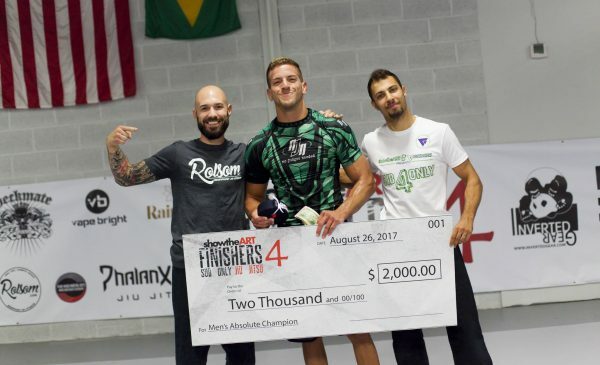 With Jesseray Childrey taking home the $300 prize for best non-leglock submission for an arm triangle from bottom half guard, all four finalists ended up taking home some form of cash prize, for a total event payout of $4,750 back to the competitors. The teens also put on a show with their superfights. Grace Gundrum defeated Jasmine Johnson by dead orchard armbar, Jhondy Fuller defeated Ameer Anbar by triangle, and Randi Miley defeated Brooke Fahey by rear naked choke in overtime. You can watch a replay of the event at the Show the Art YouTube page, where you can also find replays of the first three events.